/Tire care and maintenance​​ /Do My Tires Need to Be Rotated? Tires need to be rotated regularly so they last longer and have even wear. However, many drivers tend to overlook the procedure, endangering themselves and their vehicles. Statistics say that nearly 11,000 tire-related accidents happen every year, many of them because of tire failure due to uneven wear. 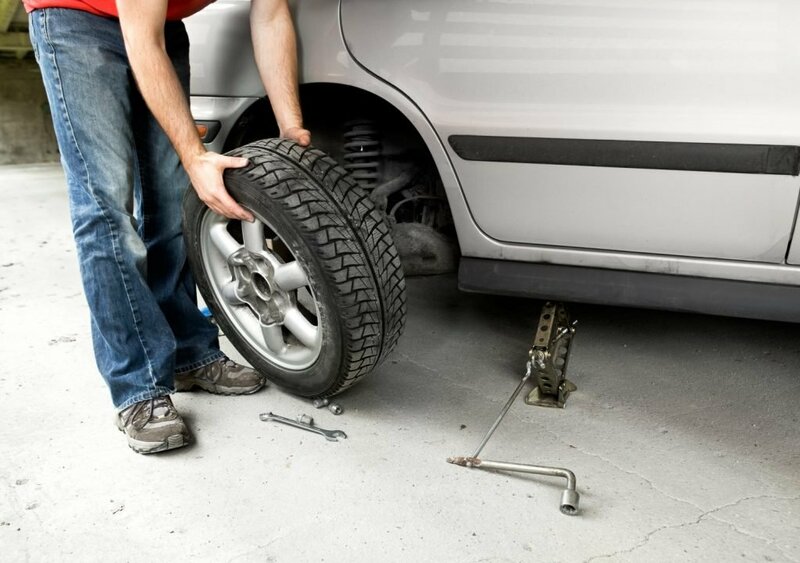 That’s why the National Highway Traffic Safety Administration (NHTSA) encourages motorists to include tire rotation in their maintenance routine, as a part of the TireWise campaign. You need to rotate your tires to prevent uneven wear. Every tire wears at a different rate, as the weight distribution varies from left to right, front to rear. The front wheels carry more load, due to engine and transmission mass, which is most often also in the front. Plus, they take the most stress during turns and when braking, and if these are the drive wheels, the pressure on them amplifies. The difference in weight every wheel has to carry mean you need new tires more often than usual. If you want to know how often you should usually buy tires, read this article. Furthermore, traffic is on the right-hand side in the US, and most parking ramps also have the same curve direction. Therefore, the left front tire travels more over the years and wears more as the result. Tires also need to be rotated to improve the gas mileage of your vehicle. More tread means less contact patch area, which, in turn, means less friction. The result is lower rolling resistance, which is one of the keys to fuel economy. The rule of thumb is tires need to be rotated every 5,000-8,000 miles, or every 6 months. However, different car manufacturers may suggest their own time- or mile-related guidelines. For example, Subaru recommend tire rotation every 7,500 miles or 7.5 months, depending on which comes first. On the other hand, BMW deem rotation an unnecessary service, which is a topic for a debate. You can find your manufacturer’s specifications in your owner’s manual. Tire rotation can cost you $25-$120, depending on the place. Dealerships usually have higher prices than regular tire shops. The prices also range may also depend on the number of tires to work with and the pattern of rotation. Besides, some of the shops will rotate your tires for free if you buy a tire or a set from them. Most tire services will also provide you with a warranty of about 6 months. In this case, uneven wear doesn’t mean an irregular pattern throughout the tread of one tire. It means when the front tires wear faster than the rear ones. If you notice this happening with your tires, they need to be rotated as soon as possible. The wear difference will soon become insignificant if the tires aren’t worn out completely. However, you may also notice an irregular wear pattern on one of your front tires, where one side has less tread than another. If the treadwear isn’t severe, the tire can be rotated, but if it is, it’s better to change the item. At speeds of 45 mph and higher, you may feel a vibration, which may be caused by uneven wear. This isn’t the only cause for vehicle vibration, with the most frequent being tire imbalance. Nevertheless, when you notice unusual vibration, your tires need to be rotated, balanced, or the wheels aligned. If one tire loses air slowly, yet faster than the others, it may mean too much pressure is put on it. In this case, it would be a good idea to go to a technician for an inspection. The tires may need rotation, or repair from a puncture, etc. How to Rotate the Tires on My Own? Park the car and set the parking brake. Block the tires opposite the side you will be working on first. This will prevent the car from moving while you’re rotating the tires. Loosen the lug nuts so it’s easier to spin them off when the car is elevated. Use a car jack and get jack stands for every wheel, if you find it necessary. This is recommended especially if you have a jack that came with your vehicle. Remove lug nuts with a lug wrench and put them somewhere safe. Remove the front and rear wheels, and swap their positions. Before remounting the wheels to their new places, inspect the tires and look for uneven wear, punctures, cuts, or any other damage. Also check whether the tread has reached its treadwear bars, and if it has, the depth is 2/32” or lower. If it is, this means you need a new tire as soon as possible. If everything is alright, mount the wheels and thread the lug nuts tight. Then use a torque wrench to tighten them further, according to the manufacturer’s specifications. Try to put the lug nuts diagonally from one another to achieve better results. Go to the other side and repeat the above steps. NOTE: This algorithm is good for the easiest front-to-rear rotation. If your tires need to be rotated in a more complicated pattern, you may need another sequence of actions and further help. The front tires move back on the same sides, while the rears go to the opposite sides to the front. 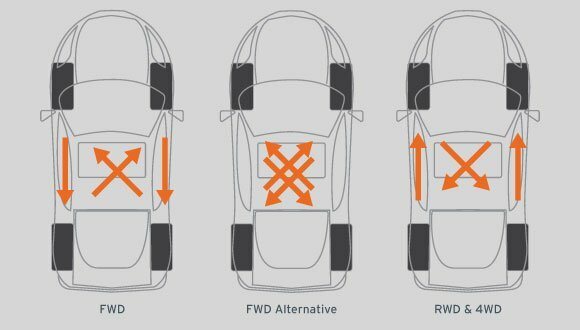 Use this pattern if you have a front-drive vehicle. The fronts move to the opposite sides on the rear axle, while the rears move to the opposite sides on the front axle. This pattern is also for front-drive vehicles. Here, the front tires go to the opposite sides on the rear, while the rear tires move straight to the front positions. This pattern is for 4-wheel drive and rear-drive vehicles. For directional tires of the same size, exchange the places on the front and rear tires of the same side. For non-directional tires of different sizes, rotation has to be side-to-side, so the rears remain on the rear axle, and the front on the front. Note if you have directional tires of a different size, you should dismount them and remount on the opposite side. The rear tires go to the opposite places at the front, while the left front goes to the rear left side, and the spare goes to the rear right side. The right front tire becomes a spare. This pattern is for front-wheel drive vehicles. For 4-wheel or rear-wheel drive: rearward cross. This pattern has the left rear tire on the left front, and the right front tire on the left rear. The spare goes to the right rear place and the right rear takes the right front position. As a result, the left front tire remains as a spare. This pattern works for 4-wheel and rear-wheel drive cars. NOTE: For a 6-wheel tire rotation, look at the 14th page of the Rubber Manufacturers Association Tire Care & Safety guide. There you can find more on keeping your tires out of trouble. Spare Tire Rotation: Yes or No? When your tires need to be rotated, including the spare in the pattern is a good idea. However, this is only if it’s of the same size and capabilities as the main set. Spares may have a “T” as a part of their sidewall code, meaning they are for temporary use only. They are usually much smaller than the main-set tires and look like a donut. These should be used only to get to the nearest tire shop, to repair or change the damaged main tire. 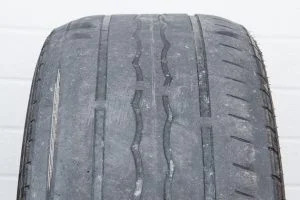 Temporary tires are usually much lighter, decreasing the weight of the vehicle and making the main tires’ work easier. However, if you choose to have a full-sized spare capable of carrying the same load at the same speed, put them into rotation. The tires will last longer, as you will have additional 40,000 or so miles in the back of your car as a spare. Do Radial Tires Need to Be Rotated? Yes, tires of any construction (radial, bias-ply or bias-belt) need to be rotated. Nowadays, most of the tires on the market are radial, so all the rules apply to them in the first place. What Is the Difference Between Tire Rotation and Balancing? Tire rotation deals with position change on the axles of the vehicle. It’s done to achieve even weight distribution between the tires, unlike tire balancing. The latter doesn’t require tire position change and deals with weight distribution within the tire itself.. You can learn more on tire balance and what to do if you need it in this article. Remember that both processes are equally important for even treadwear, tire lifespan, absence of vibrations, and vehicle safety. Do Tires Need Balancing After Rotation? No, if the rotation pattern you use doesn’t involve dismounting a tire off its rim. When tire-wheel unit is balanced, it doesn’t matter what side of the vehicle it is at. However, it would be wise to check whether the tires are properly balanced every time you rotate them. Balance can break when the vehicle hit a large pothole at high speeds or tire wear out enough for the weight distribution to change. Do Trailer Tires Need to Be Rotated? Yes, but you shouldn’t rotate them along with the vehicle tires unless they are of the same specifications. Two- and three-axle trailers usually require more attention to tire rotation, but it’s a good idea to check your one-axle trailer once in a while too. You can rotate the tires using the X pattern (rear-right to front-left, rear-left to front-right, middle (if any) side-to-side). There’s another pattern that is easier: rotate the tires on the same axle side to side. Note that trailer tires are usually marked with “ST” before the size code. After Tires Are Rotated, Are They Aligned? Wheels are aligned independently from tire rotations, as the procedure’s main element is suspension. If it’s aligned right, whatever wheel you put on, it will be aligned. However, it would be a good idea if you check the alignment every time you rotate the tires. This will ensure the alignment is right, and your tires will wear evenly, as well as the suspension. How Often Do Truck Tires Need to Be Rotated? As often as any other tires, or as often as specified in the owner’s manual. The rule of thumb is to rotate the tires every 5,000-8,000 miles, but some manufacturers recommend rotation every 3,000 miles. How to Tell My Tires Were Actually Rotated? 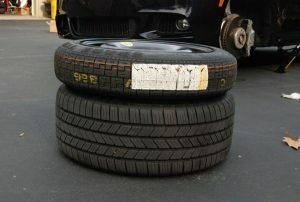 The best way is to mark your tires beforehand to know which is which. Also, if you keep an eye of your tires, you should know whether there’s any uneven wear on any of them. This will also help you determine whether your technician have rotated the tires. Besides, if you have directional tires, check whether they are in the right place. An unexperienced technician may have not only rotated the tires, but also put them in wrong places.